Office Ergonomics: What it is, Why it Matters & What You Can Do About It! Implementing an ergonomic program can result in a 25% increase in productivity and a 58% decrease in absenteeism! Seamlessly blend flexibility, convenience, and functionality with our office furniture solutions. Completely adaptable to meet the needs of your performance-driven workplace, our office furniture is stylish, modern, and built with a focus on comfort and productivity. We provide an extensive selection of furniture solutions for a variety of workplaces, ranging from the traditional office to unique environments like healthcare facilities. Whether designing a new space or adding to an existing one, our office furniture will complement your layout perfectly. With the right office furniture solution, everyone in your facility can be both comfortable and productive. Providing comfortable ergonomic seating in the boardroom, private office, or collaborative space is essential in today’s market. Desks combine storage with functionality for aesthetically pleasing solutions that adapt to any workspace or private office. Tables provide employees with spaces to collaborate—from the lunchroom to the boardroom and everywhere in between. Our versatile filing & storage solutions are scalable based on your size requirements to keep your documents and data securely stored on-site. When people are uncomfortable or in pain, they aren’t productive, and they are more likely to take sick or injury leave. Collaborative Spaces encourage flexibility and innovation in your space by creating a collaborative work environment for your team. Health Care Furniture is adaptable to meet the needs of your team, as well as patients and family members. Save time and money by reducing your storage footprint with high-density storage. Office Interiors is glad to provide you with office furniture from many of the world’s most well known and respected brands. We’re also incredibly proud to be known as the preferred dealer for Haworth office furniture in Atlantic Canada. To learn more about the brands we carry and how our solutions can help your office or healthcare facility, contact our experts today. If you’re interested in discovering more about trends that are shaping the look and feel of modern offices, download our FREE Trends Guide. Inside, you’ll get a closer look at the office furniture that help professionals love the way they work. 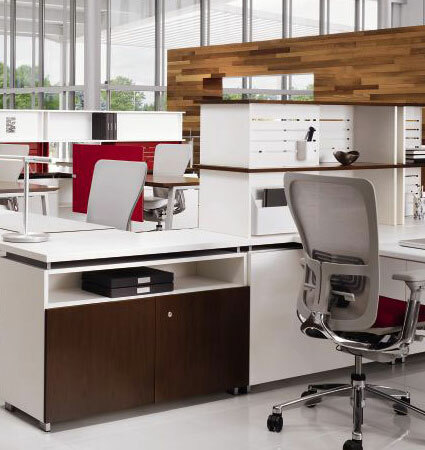 At Office Interiors, our office furniture solutions are designed to ensure employees excel in the workplace. As your space evolves, you’ll want solutions that can evolve with it, which is why many of our office products can be adjusted or completely designed to scale. Collaboration is crucial in many offices. Your team-driven environment will flourish with our collaborative solutions that allow ideas to take shape nearly anywhere. When your staff has access to office furniture and ergonomic tools that blend functionality with comfort, productivity and employee satisfaction increase.